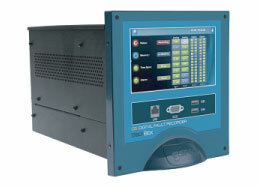 The BlackBox DFR, a fully featured digital fault recorder embedded with PQZIP technology, is a distributed multi-functional data acquisition device that continuously records all waveform signals at a sampling rate of 1,024 samples per cycle. The continuous waveform recording makes the BlackBox DFR ideal for monitoring all power quality load profiles and synchro phasors, enabling complete isolation and analysis of any event, providing solutions for protection and optimum operation of the electrical system. Exclusive only to the BLACKBOX, the DFR can record & store all electrical waveforms, for more than a year (Voltage and current at 1024 samples per cycle). It calculates RMS, harmonics & all desired values from waveforms in post-processing that includes calculations of over 10,000 parameters. Obtain a clear and comprehensive picture of conditions leading up to, during, and after an event. The G5DFR measures and records 5,000 power parameters continuously at a resolution of ½ cycles, 10/12 cycles, 150/180 cycles, 10 min and 2 hours of which, any given resolution is calculated for display and reporting purposes. Hence, there is no need to select which parameters to log, and more importantly, which parameters to ignore. The G5DFR has two FFT engines for harmonics analysis: Cycle by Cycle: performs FFT at 1 cycle resolution for extended bandwidth. This engine provides 512 harmonics order at 50Hz resolution. 10/12 Cycles: performs FFT 10/12 cycles resolution for extended resolution and sub-grouping calculation. This engine provides the magnitude and angle of 512 spectrum components at 5Hz resolution. signals continuously. The event configuration doesn’t trigger the recording but stores summary logs including start and end time, duration, severity and magnitude of the event. All the events can be displayed in a tabular or scatter charts as CBEME/ITIC. A unique time synchronization algorithm assures that logged data from multiple units is synchronized & displayed on the same time scale with typical 0.1 ms resolution. Every event on a grid is accurately analysed for precise root cause analysis, behaviour propagation, and traced to its source.